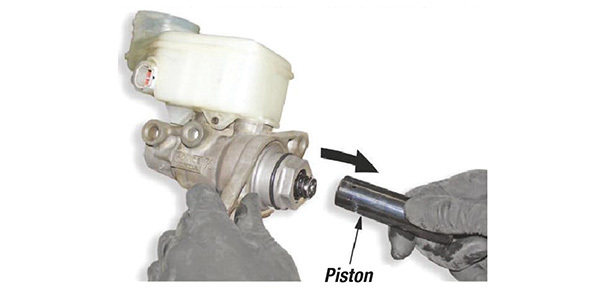 A cup seal in the master cylinder is sensitive to the type of brake fluid used in the brake system. If the brake fluid is replaced with anything other than Acura (or Honda) Genuine DOT 3 Brake Fluid, and the brakes are manually bled, the cup seal may twist in its retention groove and create a small leak. The brake fluid can then leak into the brake booster, and the brake system indicator will eventually come on because the brake fluid level is low. If the owner continues to drive the vehicle without reﬁlling the brake fluid reservoir, they may notice the brake pedal feel slow or spongy. The driver should not rely on refilling the brake fluid reservoir to address the problem. 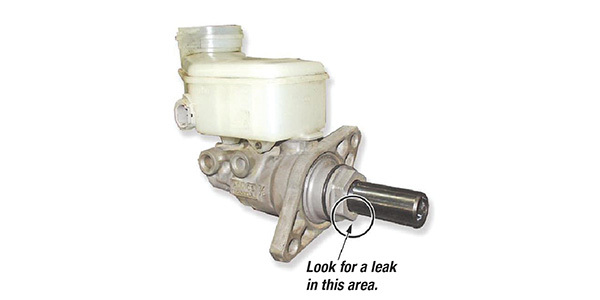 A prolonged leak would eventually cause one of the two brake system hydraulic circuits to fail. Install a master cylinder repair kit and, if needed, replace the brake booster. Vehicles that have already had the procedure performed at the dealer will have a center-punch completion mark above the ninth character of the engine compartment VIN.